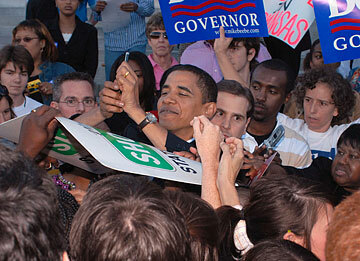 U.S. Sen. Barack Obama, D-Ill., signed autographs yesterday while helping at a campaign event in Little Rock, Ark. AUSTIN, Texas » U.S. Sen. Barack Obama, promoting his latest book, got a rock star's reception yesterday at a venue that's usually much less welcoming of Democrats -- the Texas Capitol. Several hundred people filled the House chamber to hear the possible presidential candidate speak at the 11th annual Texas Book Festival, an event begun by first lady Laura Bush when her husband was governor. Much of the crowd shrieked and jumped to its feet when Obama walked in through a side door. Outside, another couple hundred people waited up to five hours to get his autograph. The junior senator from Illinois is promoting "The Audacity of Hope: Thoughts on Reclaiming the American Dream." Obama, the nation's only black senator, created a stir last Sunday when he acknowledged he was considering a run for president in 2008. Several people waiting in line for his autograph said they wanted to see for themselves what kind of candidate he would be. About 35,000 people and about 180 writers -- including children's author Louis Sachar and novelist, playwright and political pundit Gore Vidal -- are expected to attend the free weekend festival, which raises money for public libraries. Police opened a negligent homicide case after a 40-year-old Ewa Beach resident died from injuries sustained during a crash earlier this month. The man was on a motorcycle on Olomea Street when he was involved in a collision at 2:12 p.m. Oct. 7. He was taken to the Queen's Medical Center, where he had been in critical condition. He was pronounced dead at 3:30 p.m. Friday, becoming Oahu's 80th traffic fatality in 2006. Last year at this time, there were 62 traffic fatalities. Detectives were investigating a possible drowning at Magic Island last night after a woman's body was pulled from the ocean at about 7 p.m., Honolulu police said. A man apparently reported his wife as missing at 5:30 p.m., but there was possible miscommunication with police because the man's English was not very good, said Honolulu Fire Capt. Greg Ikeda. Firefighters were called to the scene by police at 7 p.m., Ikeda said. But when firefighters arrived, police were trying to revive a woman that had been pulled from the ocean, he said. A 31-year-old Honolulu man was in critical condition yesterday after an early morning crash on Pali Highway. The man was driving a red 1986 Nissan pickup town-bound on Pali Highway just south of the Waokanaka Street onramp at about 1:37 a.m., when he veered left onto a grass median and crashed into a tree, police said. He was extricated from the vehicle and taken to the Queen's Medical Center. Speed and alcohol were apparent factors in the accident, police said. The truck was not equipped with airbags, and it is unknown whether the man was wearing his seat belt. Police are looking for a man dressed as a woman who robbed the American Savings Bank branch at 1018 McCully St.
CrimeStoppers and the Honolulu Police Department are seeking the public's help to identify and locate a man wanted for robbing the McCully branch of American Savings. On Thursday at 3:50 p.m., a man dressed as a woman entered the bank at 1018 McCully St., presented a demand note, and fled with an undisclosed amount of money on foot eastbound on Young Street. No weapon was seen at the time, police said. The man was described as being in his 20s, weighing 160 to 180 pounds and standing about 6 feet tall. He had brown hair in a ponytail and wore a gray hat, brown sunglasses, yellow shirt and dark pants. Anyone with information about this person is asked to call CrimeStoppers at 955-8300, or *CRIME on a cellular phone. CrimeStoppers will pay a cash reward of up to $1,000 for information that leads to the arrest of this suspect. Eric Razo, 19, of Kailua-Kona, died yesterday morning after an accident in Kona, police reported. Kona patrol officers responded to a 2:16 a.m. call on Kaleopapa Street. Razo was driving his 1998 Toyota Tacoma east and struck an embankment near the Alii Highway intersection, police said. Razo was transported to the Kona Community Hospital, where he was pronounced dead at 4:06 a.m. Police said alcohol and speed may be factors in the crash. This is the 30th Big Island traffic fatality this year, compared to 29 at this time last year.